Nestled betwixt the Severn & The Wye, neither Welsh nor quite English. An understated area of outstanding natural beauty, largely undiscovered by the masses – The Forest remains a playground whether your interest is industrial heritage, wildlife or outdoor pursuits – its got something for everyone. Clean, budget bungalow in the heart of the Forest. To keep costs low, we only supply bed-linen and towels on request and make a small charge of £5/head for bed-linen and £5 for one bath-towel + one hand-towel. Please advise on booking. Staying in the Forest: The ancient Forest of Dean – historically an industrial area which was founded in Roman times for iron-ore mining, sometimes being described as the “Sheffield of the South”. This however resulted in the large-scale decimation of the ancient forest, only to be replanted in the 1700s for planned future ship-building. As former royal hunting grounds, the area was extensively mined for coal in the 18th & early 19th centuries with industry in decline in the 20th century. The Wye valley is formally designated as an Area of Outstanding Natural Beauty (AONB). With great access to birds, wildlife, canoeing, caving, cycling, walking or simply stunning countryside. Please call to discuss your needs and we’ll point you in the right direction so you get exactly what you want from your countryside break. To keep costs down, we only supply bed-linen by arrangement at a cost of £5/head. Please advise on booking. Croquet & Boules available to borrow. Has a small-holding adjacent with goats & chickens Eggs can be purchased from the small-holder and Maurice (Hollies owner) will share plums, pears & vegetables in-season. Perfect bungalow containing all you need. Location is perfect, we visited Wye Valley Butterfly Zoo, Clearwell Caves and Goodrich Castle, all less than 15 minutes drive away. Our 15 month old baby also enjoyed her stay, there's plenty of room for a travel cot in both bedrooms and a high chair available also. I'd highly recommend The Dog & Muffler pub and The Butcher's Inn, both a short drive away also. We will be back, thank you! We spent 3 nights and wish we could have stayed longer every thing we needed for a comfy peaceful time. Many thanks for the glowing review. Hope to see you again soon. Maurice & Margarette. Ideally located to explore the Forest of Dean as well as the Cotswolds. Beautiful walks and scenery on the doorstep. The bungalow had everything we required and more. Thank you Mr and Mrs Phelps for having us. I highly recommend to anyone looking to explore the area. Thank you for the recommendation. Hope to see you again soon! Had a great stay here, in the middle of all the tourist destinations, comfortable and clean. Would recommend. Thank you! Hope you come again sometime soon. 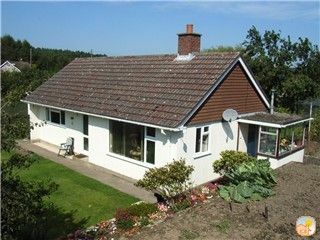 Roomy bungalow, ideal for dogs. Equipped with everything you could want. Perfectly located for visiting all the lovely places nearby and lots of good pubs and places to eat. A peaceful place to stay and relax,even for a longer stay. Luck for our son was the Wifi, internet doesn´t work everywhere in that region, especially if you come from abroad. We enjoyed the garden with terasse and the goats and chickens as direct neighbours. Maurice and Magarete are lovely people and made us feel welcome. So glad you enjoyed your stay and hope to see you again soon. Amazing for cycling, walking, climbing, caving, birdwatching, canoeing and beautiful scenery. Forest tracks for cycling and walking on doorstep. Designated all-terrain cycling area on doorstep. Pedal-a-bike away (cycle hire):1.5miles. River Wye: 2 miles. Clearwell caves: 5 miles. Goodrich Castle: 3 miles. Go Ape (tree top walk): 3 miles. Dean Forest railway: 2.5 miles. Symonds Yatt: 3 miles. Dean Heritage Centre: 5 miles. To keep costs to a minimum, we ask that guests bring duvet covers/pillow cases and towels (although these can be provided on request at £5/head per stay for bed linen and £5/head for drying towels). PLEASE ADVISE REQUIREMENTS UPON BOOKING.